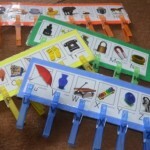 An important step in learning to read is for children to name and quickly recognize letters. 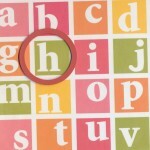 As part of learning the alphabet, we will draw a child’s attention to how letters are alike and how they are different. We will encourage children to notice that letters are made up of straight lines (“T”) and curvy lines (“S”) and a combination of the two (“B”). 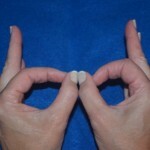 We point out that letters can be very different (“T” and “O”) or very alike (“N” and “M”). 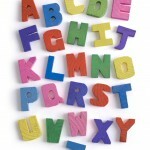 As adults, we tend to think of learning the alphabet as a visual activity (i.e. using books, pencils and paper) but children can also learn to notice how letters are alike and different by using their sense of touch and by actively exploring the letters. 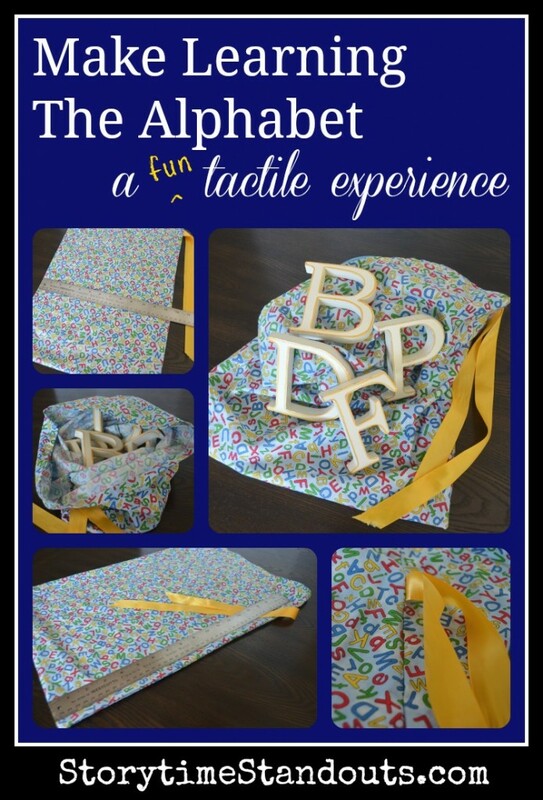 When we use a letter bag, we introduce “tactile or Kinaesthetic” learning – learning the alphabet by doing and touching. 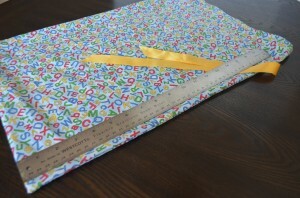 I made my own letter bag from a bright, colourful fabric print. If you don’t need yours to be durable, a paper bag will work equally well. I used four or five wooden letters that I purchased at a dollar store, you could use foam or wooden letters from a puzzle or magnetic letters from under your fridge! 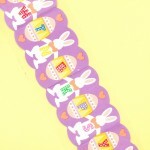 Try to find letters that are relatively “simple.” For this activity, a basic letter, without embellishment is best. 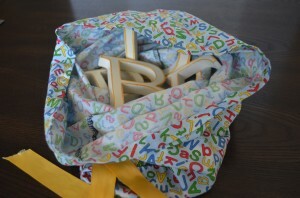 The letter bag and letters are intended to be used by an adult and a child (or children) together. 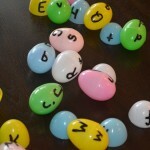 Ideally, the adult begins by talking about the shapes and attributes of four or five letters before putting them in the bag. Point out how the letters are alike and how they are different. Name the letters. Once the child knows about the letters, put them all in the bag. 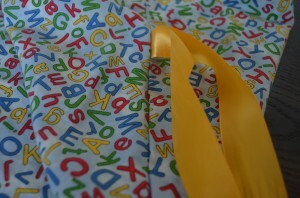 Have the child reach into the bag (no peeking) and then ask her to see if she can find a particular letter. As she feels the letters, the adult can talk about the attributes of the letter that the child is trying to find. For an older child, who knows letter sounds, the adult could say the letter sound and have the child find the right letter in the bag. Please note: my experience has been that some children find this way of learning the alphabet relatively easy while others will pull all four letters out of the bag before they find the one they are looking for. As adults, we need to be patient and understand that children have different learning styles and the best thing we can do is to offer all sorts of ways for children to discover and learn.